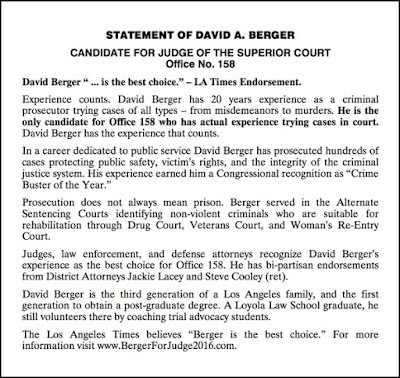 Voters considering who to vote for when it comes to Judge of the Superior Court have little information to go on. In an effort to fully inform voters about the choice for Office 158, my campaign has secured a ballot statement in the Voter Guide. That means my message will reach every registered voter in the November 8, 2016 election. It's a novel strategy, but with the Presidential Election resulting in at least 304,000 new voters in Los Angeles County, chances are new voters will read all the information available to them, and when it comes to Office No. 158, there is only one ballot statement.